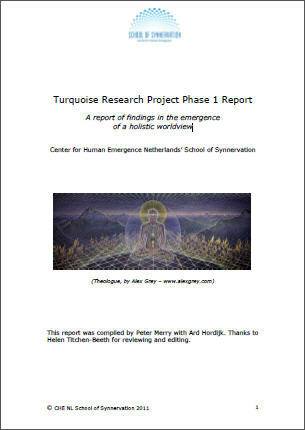 For the past year, we at the Dutch Center for Human Emergence’s School of Synnervation have been researching into the qualities and expressions of what in Spiral Dynamics is known as the Turquoise / Holistic value system. The impulse for this came as we reached the limits of our existing coping mechanisms and had a sense that this is what was needed next – for us and others in the world. For this project we experimented with an Integral research framework and process, which the report also describes. We remind people that this is just the start of an inquiry, not a final proclamation of an absolute truth ;-). It’ll be interesting to see what putting this out there will generate. If the initial announcement that we were doing this in the Integral Institute LinkedIn group is anything to go by, many creative (and not-so-creative) sparks may fly! Bring it on! This entry was posted in Ongoing reflections, Resources and tagged center for human emergence, integral theory, school of synnervation, Spiral Dynamics Integral, turquoise by Peter. Bookmark the permalink.